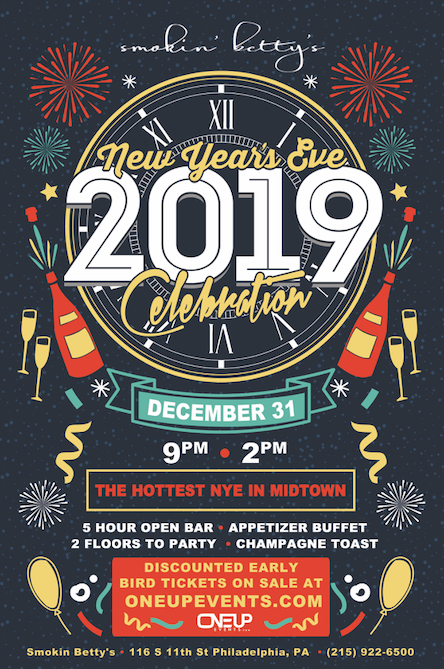 Join us at the ultra sleek pin-up inspired bar at 11th and Samson in Philadelphia's trendy Midtown Village neighborhood for a NYE experience you’ll remember for a lifetime. The downstairs area will feature a decadent buffet featuring some of Betty's favorite food items, a private bar area for you quiet conversations and a large area with tables. Go upstairs and turn up with DJ spinning top 40, throwbacks and all your favorite hits. This truly beautiful space will give you a night that you won't soon forget with a ball drop and champagne toast at midnight! Make sure you get your tickets early as the prices will go up as we get closer to selling out! What time should I arrive? The earlier the better, there might be a small line outside between 10:30 and 11. When is the best time to buy tickets? Don't wait, prices go up as we get closer to NYE. This is a very exclusive event with limited tickets available and will sell out early. Will I have a place to sit? Yes, there's plenty of seating available. Is there a Dress Code? It's New Years Eve so dress to impress! Dressing up is recommended but not mandatory. Only severely underdressed individuals will be turned away at managements decision. What's included in the Open Bar? Premium Liquor, Beer and Wine brands will be offered. What's NOT included in the Open Bar? Shots, Select Craft & Imported Beers, Top Shelf Liquors and Red Bull are not included in the open bar package but may be purchased at the main bar upstairs. Do you have a refund policy? Tickets are non-refundable but are transferable. You can resell your tickets if you're unable to attend.